Sometimes the kids get it. 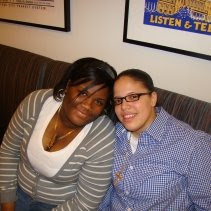 Defying the often homophobic society we live in, students at Mott Haven Village Prep High School in the South Bronx, have chosen a pair of lesbian students as the school's "Best Couple". The seniors, Vicky Cruz and Deione Scott, got four times more votes than the two straight couples competing with them. This is a first, both for the school, and, according to NYC's Department Of Education, the entire city, with the possible exception of Harvey Milk High School, the city's "safe haven" high school for LGBT teens. It's wonderful to see ignorance defeated too. It certainly appears these girls are well-liked and respected by their peers, and that their sexuality hasn't diminished this one bit. It does give me a glimmer of hope that the LGBT community will find more acceptance in our society in the years to come. Mott Haven's students are teaching us all a lesson in understanding today, and as they graduate and go forth into their adult lives, perhaps they will impart their wisdom onto the rest of us. If the gay and lesbian community is to enjoy better tomorrows than our yesterdays have been, the achievement of these dreams will come from this young generation. Hats off to Vicky, Deione, and the Class of '09 at Mott Haven. You made me smile today. This made my day. This may have made my week, month and year! It's great to see this Nathan. Thank you so much for posting this. Shout out to Vickie and Deione. Your courage is just what we need. My hat goes off to you!